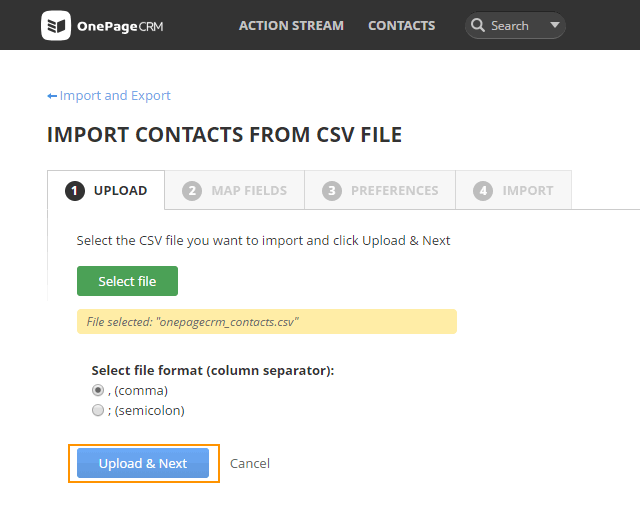 You can import multiple contacts at once into OnePageCRM once your file is saved in a .CSV (coma separated value) file format. You can import the following fields: First name, Last name, Job title, Organization, Status, Phone (Work), Phone (Mobile), Phone (Home), Email (Work), Email (Home), Contact and organization Address, Zip, City, State, Country, Website, Background, Tags, Next Action text, Next Action date, Lead source, Notes plus any Custom Fields you've created. Go to gear icon → Import and Export. 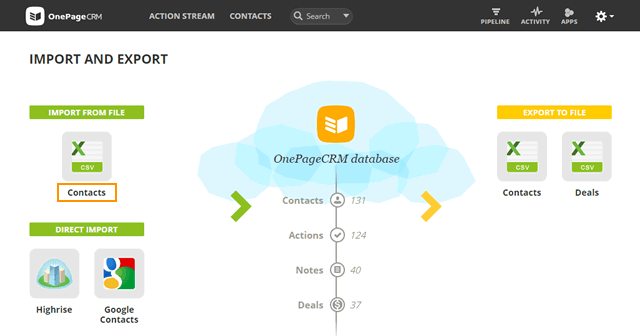 On the IMPORT AND EXPORT page, go to IMPORT FROM FILE section and click on Contacts icon. Select your preferred .CSV file format: , comma or ; semicolon. In Step 2 MAP FIELDS from your uploaded file to with OnePageCRM database and click Next. Note: If you used our sample file, fields will be matched automatically. Set your preferences to all imported contacts and click Next. 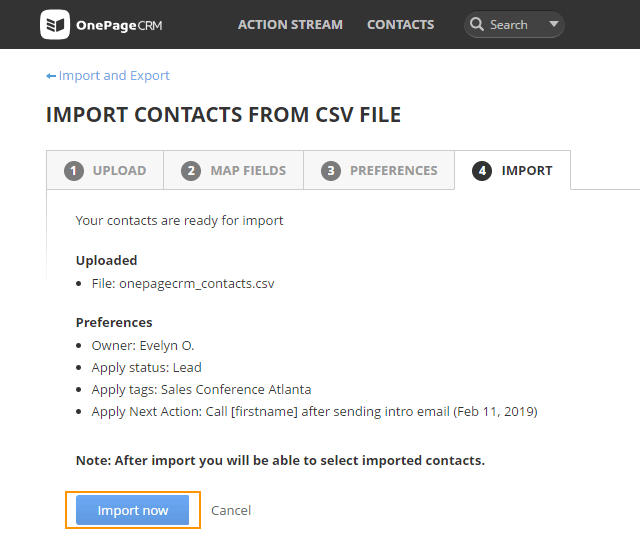 Note: All contacts in OnePageCRM must have a status, if you don't have a status already assigned on your import file, then you can choose a default status here. Review the details of your import and click Import now to start the upload. Once the import is successful, a message "Success! Your import has been queued. You will be emailed when it is completed. Go back to the Import and Export Page to see its progress." will appear. 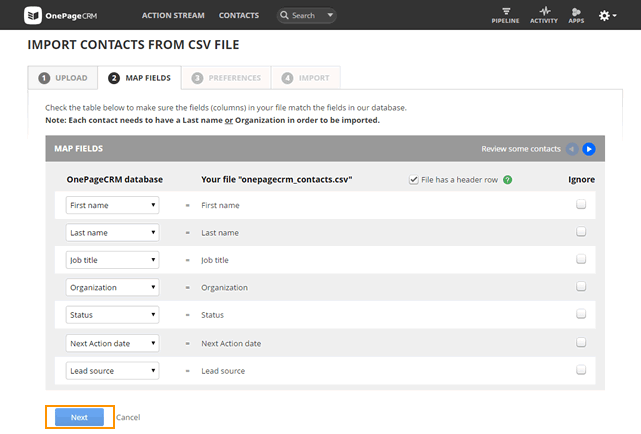 The Next Action text and date that you entered under Preferences will only be added to contact records with empty Next Action text and date fields in your .csv file. 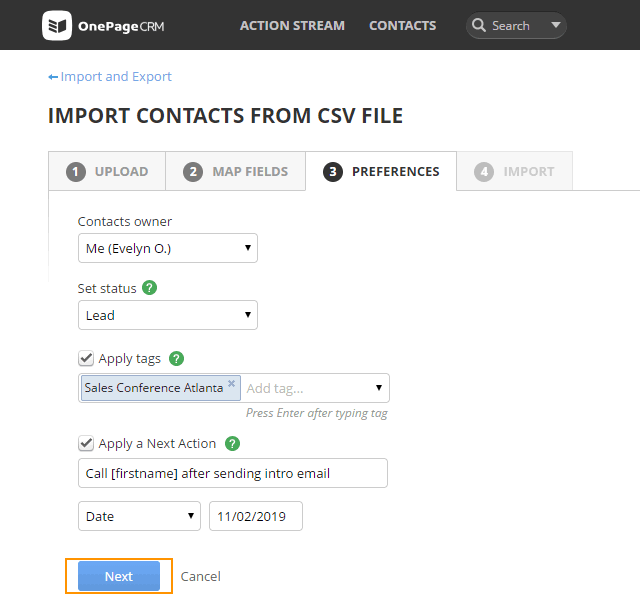 You must create custom fields in OnePageCRM prior to doing your import. Maximum file size allowed for .csv import is 128 MB / 9999 rows. If your file is larger then you'll need to split it into smaller files. The default column separator for .csv file is the , (comma) character. To cancel an import within 24 hours from the initiation, go to Import & Export page scroll down to Import / Export history section and click Undo import.